Hi folks, the wheel has been spun and it landed on Wet Coast Racer's name!!! Gee, do you think he lives in Maine? Naw, WCR/Wet/Wet Goat (lol)/Wet Coast, etc lives in the beautiful Northwest village of Vancouver, British Columbia. Boy I hope I got the BC part right. 1) Hello WCR! Welcome to the hot seat. So, did the lumberjacks keep you in Canada? Just kidding. Please tell us of your unique Canadian background. And, do you maintain dual citizenship? Well thank you Lawrence for this chance to shine. Or not. Prolific provider of Posts that I may be, I gotta say I've been pretty impressed with some of the characters who have sat in this hot seat already, and their huge contributions to slot racing, cars, and this other important stuff that makes us all smile. Some hard acts to follow, there. Well, I wouldn't say it was the lumberjacks, you know; some of them are pretty smelly and none of them can really sing that well. Mind you (he said, doing his bit for the tourist industry) the Squamish Logging Festival is worth a look if you're up this way in August. Here in the rainforest, logging remains a major part of the economy. As does ranching, incidentally; around here, we eat Texans for breakfast. But indeed, I do hold dual citizenship; my family background is strongly north of England (Cumbria) going back to at least the end of the eighteenth century according to the records and probably long before that; my mum and dad were both from Carlisle, just south of the Scottish border. But life in the UK in the postwar years wasn't that rosy, so they emigrated to Canada, which is how I ended up being born in Winnipeg. A good place to be from, I should say. Which is why as a baby I moved back to the UK (taking the family with me) and grew up there. No, really. But, the plot thickens (of course by now most readers have already left to see what's happening in the 1/43 Forum), as they emigrated again in 1969. And, of course, later moved back to the UK. Again. Which is how I ended up as a transplanted Brit in the country of my birth, so to speak. Well, not exactly. Though you never know when they might show up, all teeth and claws and voracious savagery! The answer almost alludes me ... but it would have to be [ame="http://www.youtube.com/watch?v=crIJvcWkVcs&feature=related"]this one[/ame], it cracks me up every time. Y'know, at one time a few years ago - about a year after I returned to the hobby after a long absence - I started taking an inventory of what I had recently purchased and realized I had 28 slot cars. This at a time when my track was still under construction so in my ignorance I had acquired quite a few front motor Fly cars and various others. But anyway, I said to myself, "Self", I said, "Who actually needs to own 28 slot cars?" So now I have quit counting them, it's much easier that way. Some of the cars that delight me the most are the Scalextric Caterhams, lightweight little slidey buggers that they are. The supposed shelf queens that will probably, sooner or later, end up being run include a Fly Marcos Jarama 1998, an SCX Gulf Audi, and a Carrera Bentley. That one's easy, you just have to look at the RAA 2008 to realize my favourites are the GT & Prototype cars found at LeMans and in the ALMS series. For me, these race cars (as compared to F1 or NASCAR for instance) are the ultimate modern aesthetic blend of form and function. Slot.it, for the affordable racing quality built into their cars. Fly, for pushing the whole industry into producing a decent scale model, finally. Scalextric, without whom neither of the previous would have a reason to exist, and for continuing to build excellent slot cars. But you know, some of those NINCO cars have fundamental goodness, and SCX have been rocketing ahead since the Dome Judd and they discovered the motorpod. I really like some of their cars these days. Round wheels. Wheels that have the shape of a curve, everywhere equidistant from a fixed point. Wheels with a true circumference, radius, width, diameter, and balance. Not square wheels, mind you. We are talking here about wheels without eccentricity. Circular wheels. Wheels that do not rock, so much as roll. Ain't nothing like the wheel thing, baby. Truth be known, I'm pretty ambivalent when it comes to hockey; back in the day when I had more time and inclination to watch TV sports NFL Football engrossed me; I would have money riding on every game, every week. Who is this Godzilla guy, of whom you speak? I have been a solid F1 fan since whenever; I was only ten when this event took place, but somehow or other F1, what I always think of as Grand Prix racing, is a fascination bordering on obsession. Jim Clark, Graham Hill, and Stirling Moss were household names, revered in their time for their skill, rather than their fame. And oddly enough for a transplanted Brit, I really get into watching baseball around the time of the World Series, the psychology and beauty of it are sublime. Sorry, but this is the nearest thing I have to a baseball emoticon. ProSlot Toyota. Ran for five laps, and the gears were stripped. Chassis cracked shortly thereafter. ProSlot Toyota. Gave me the fastest five laps imaginable right out of the box, such fantastic balance and tires. for Barbie O'Nuttin in the 2006 RAA Proxy at Super2nrs in Colorado. Dave Kennedy's 959 won that race and the class, while Smokeio's AWD Audi was second, and still remains the quickest ever on my circuit. Two Super2nr cars hold second and third quickest times here at the Wet Coast Raceway, incidentally; Not only can Purdham race 'em, but he knows how to build 'em. Mostly vicarious, unfortunately! I've been to quite a few different events, and worked as a trackside and transportation volunteer for the first three years of the Vancouver Indy; the days of Al Unser Jr., Michael and Mario, Danny Sullivan ... although for me this circuit will always belong to Alex Zanardi. I may, however, hold a record. I'm probably the only person who ever got air going over the hump of the Lions Gate Bridge. You have to be going really fast to do that, you know. Last edited by Wet Coast Racer; 10-12-2016, 11:28 PM. Oh man! Who can forget Alex Zanardi. Do you know that the man still swims in the ocean??!! That my friend is guts and character!!! I loved to watch him drive CART cars. He may not have been a consistent winner but he sure made watching CART races fun. The ProSlot Toyota TS020 (the real name instead of the GT-One) was/is a great car that needs tons of work. I have the complete set (there were 8 liveries produced) and after replacing motors, pinions and gears with SLot.It products, they run like a dream. What do you think caused the chassis to crack? WCR, another question if you do not mind. What model release are you looking forward to the most this year? Thanks for the answers dude. As they say in the commercials: BRILLIANT!!! Now go have a Guiness. 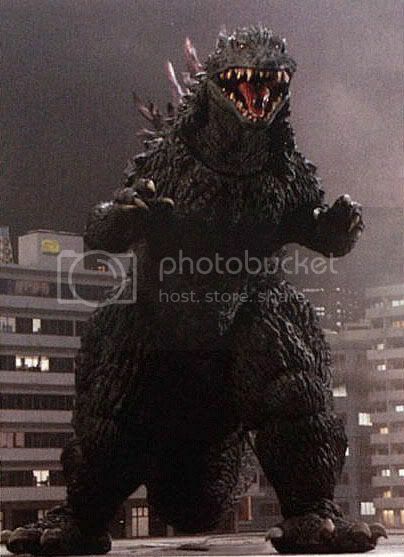 I agree with you about the ProSlot... but you should know who Godzilla is being a baseball fan and all! What do you think caused the chassis to crack? I guess they just made it too pliable; more strength needed to be designed into it beside the axle bushings. But that's OK ... I have another chassis. What model release are you looking forward to the most this year? Well the one car I'll have to pick up as soon as it's available is the Alfa 33/3; my son has a Ferrari 312PB that he's very quick with, and this is of course the perfect competitor! "I guess they just made it too pliable..."
Or maybe it was the trip into the Easy Bake oven? Lawrence, I know you appreciate Brit humour; being a vet, are you familiar with Herriot? The Pro Slot chassis was too brittle. That is the opposite of pliable. Mine cracked up, and remains wired together, to this day. It was eclipsed by the genius of Slot.It, but for a while, a relatively stock Toyota GT1 was IT on my track. Of course, it had Slot.It rear axle, gears, and Ortmann tires. But those days are over. Thanks for the memories, Paul. But, what does the future of slot cars hold for you? Where do you see yourself, in this hobby, a few years from now? I had to chime in here to mention that not only has Paul been a great Canadian Moderator here on SCI, he has also been a great "Supporter of the Sport" in other ways too .... thanks to his hospitality I have had the pleasure of racing at his fine track [towelscaping not withstanding] and also at the Archer Establishment! thanks for sharing and spreading the gospel Paul ! I am familiar with James Herriot's books but have never read any of them. I started working for a Veterinarian in 1978 as a sophmore in high school. I graduated from Auburn University's College of Veterinary Medicine in 1989. So.......I have been at this job in some form or fashion for 30 years and I am only 45! I live Veterinary Medicine 7am - 6pm+. I call our 6pm closing time a "Theorum". We typically don't get away until 6:45-7pm . Being a Veterinarian is not a job to me. Without going into too much religion (sorry Alan but I am coming out of the broom closet), when I found out I am Wiccan nearly 5 years ago, I also discovered that God put me on this planet to help and speak for the animals. That took being a vet from a job to a passion as big as my passion for slot cars....well, really even bigger. I hate to take days off from the clinic even though I have 3 other excellent vets that work for me. It's not that I don't trust them or want to be a control freak, I feel a great need to be here (I am at the clinic now) for the animals. They don't have voices so that is where I come in. WCR, your choice of releases are mine also, however, Fly dropped a bomb on Slot.It by releasing their F40 versions first. I cannot see that as pure coincidence. Any comments? BTW, SHAME ON ALL OF YA'LL. There is and always will be only one King of the Monsters! The Pro Slot chassis was too brittle. That is the opposite of pliable. But, what does the future of slot cars hold for you? Where do you see yourself, in this hobby, a few years from now? This has really given me paws for thought, (as the bear said, scratching his head). I got back into the hobby, by building my wood track, simply as the realization of something I had wanted to do since I left home as a teenager many years back. I was at a point in my life where I found myself with sufficient room in the basement to build it, the necessary funds to buy the materials, and the determination to teach myself a lot of woodworking skills (particularly routing) that I had never possessed. When I got started, I really had no idea that anybody else might be doing anything similar, and it also came as a huge surprise to discover that the slot car industy was actually alive and well (more or less) and producing some wonderful looking race cars. This all got going about five years ago, and in large part explains why I have been so enthusiastic, supportive, and dedicated to SCI and what Alan's trying to do with it. But five years from now? Well, I would like to think that another goal - track landscaping, as in a recreation of a realistic looking race track, has always been an achievable goal. The problem is, I get bored easily; and once I'm trackside, my inclination is to pick up a car and a controller every time. But finishing my track properly, and eventually posting some pictures in Tracks & Scenery Forum when I'm done that will grab people's imagination and inspiration, would be a real achievement. I don't see myself getting interested in building brass chassis or cars from scratch, but I do have a ton of slot cars that I'm oh so slowly working on to improve and tune up and rebuild so that they're actually worthwhile to run and to race. I would like to put together a small proxy series some time, just for wood track racers. So really, I haven't the slightest idea where I will be with this hobby, five years from now. I have had the pleasure of racing at his fine track [towelscaping not withstanding] and also at the Archer Establishment! I have met some great people through this hobby, and Eric is one of the best, just a really generous guy and great company. Fly dropped a bomb on Slot.It by releasing their F40 versions first. I cannot see that as pure coincidence. Any comments? Honestly Lawrence, I don't know much about how these licensing agreements work; but particularly with a company like Ferrari who are quite particular about who is allowed to market their product, and what they have the rights to, it would be my guess that at some point in time maybe a year or two back they decided to allow 1/32 scale versions of the F40 to be made (presumably by whoever was ready to pay the necessary fees). If that's the case, and I'm correct in assuming that Fly are still producing their product at the Spanish home factory - a kit, also, rather than an rtr car - then it's no surprise that they got theirs to market first. Is there an ulterior motive at work? Might this affect Slot.it in some way? Well so far, they don't seem to have had any trouble, any time, selling every car they ever produced. The lineup starts to the left, gentlemen. I am familiar with James Herriot's books but have never read any of them. That's unfortunate, because knowing of your appreciation for British humour and satire, I have been saving up some YouTube clips for you. This isn't Mr Herriot, but a lesser known northern vet, Mr Chinnery. Last edited by Wet Coast Racer; 05-15-2008, 08:27 PM. That Chinnery guy is brilliant. The first skit was just sublime. And then the evocative Kes sequence was just superb. Only the brits could do some thing like that. I write to just draw your attention to patrick Taylor's book An Irish Country Doctor. It is in the same rich vein as Herriot except it's people in Ireland and the rest you can guess. If I do not see you, before you go, have a great trip back to the old country. Remember to come back this time! Well, I'm proud to be able to call Paul a friend, despite (or more likely because of) his obvious fringe of insanity. He often makes lovely cookies with that easy bake oven of his. If he is in fact not pulling our legs, getting air on the Lions Gate Bridge is one heck of an achievement! That is not a story I am familiar with, but it does fit in with many of his others. As a wee lad I read all of James Harriott's books several times over, at a time when I thought maybe I would like to be a veterinarian. And I must say, I'd forgotten all about that Monty Python sketch, and my its a good one. Keep sending those skits Paul!!!! I guess I am a 'Bama boy who has always been a sucker for British humor . I remember watching Benny Hill on Channel 10 in Birmingham, AL as a teenager so I could see the Benny Hill show and Soccer Made in Germany. I played futbol in high school (1977-1981) and we won the Alabama State Championship our senior year. Back then, we were called all sorts of names by the football players in school because we played this odd, queer, different sport. Guess I got the last laugh on the futbol vs. football deal . As far as James Herriot, perhaps THE only reason I have never read his books is my interest in Fantasy/Science Fiction. But oh the stories I could tell you from my own veterinary experiences. You guys would be rolling in the floor. For example: I work on "companion" small animals....dogs, cats, reptiles, and birds. One day a lady called me and wanted to know if I could come out and work on her goat. "I am sorry ma'am. I only work on small animals" I replied. "Well, it's a SMALL goat" was her retort. So I worked on her goat . Hope that little story brightens everyone's day .